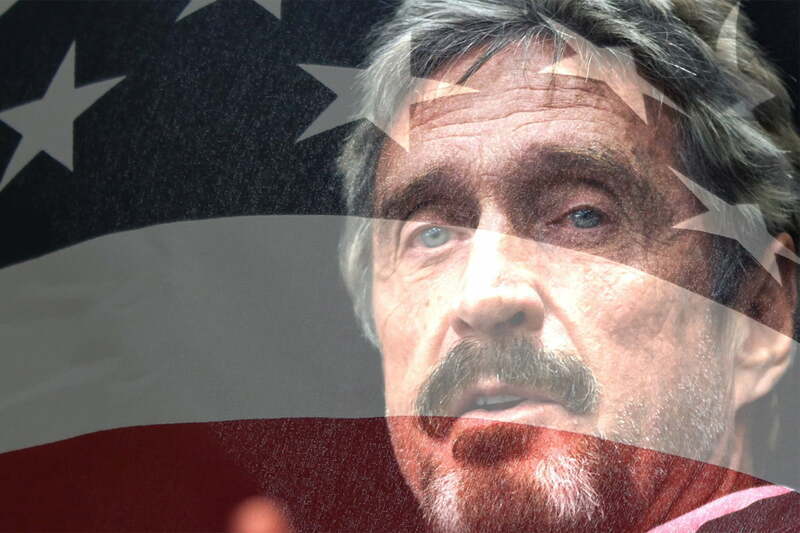 John McAfee is one of the most influential commentators on cybersecurity anywhere in the world. His new venture — Future Tense Central — focuses on security and personal privacy-related products. McAfee provides regular insight on global hacking scandals and internet surveillance, and has become a hugely controversial figure following his time in Belize, where he claims to have exposed corruption at the highest level before fleeing the country amid accusations of murder (the Belize government is currently not pursuing any accusations against him). Our government is fundamentally broken. Nobody is standing up for the people, and that needs to change. The People have had to speak up and fight for their rights from the outside for too long. The ruling establishment on both sides of the aisle promotes a culture of “business as usual” within the halls of power. Somehow, through all of those conversations, there is nary a whisper about the individual, about their rights, or anything about right and wrong. This is especially troubling when it comes to privacy. Almost daily, we open the pages of our morning papers and find yet another story about a breach of our collective privacy – impacting our individual sovereignty, our freedom, our financial futures, and affecting the trust we have placed in the wonder of technology. Clearly, many people don’t trust their government. Tragic in some ways, it is also something distinctly American, but maybe not that comfortable at this level — a product of the times we live in. The rest of these fears are overwhelmingly in the field of security, technology and privacy issues, yet I hear no real answers to these concerns. I see no party capable to do the job of fixing this correctly. I can assure you that I have the answers to fix these things, and I’m the only candidate that can do this job right. Recently, it was reported that the Internal Revenue Service has become the latest known Federal agency to use StingRay technology – the cellphone interception device. By using this device, which pretends to be a cellphone tower to gather metadata, the agency has the ability to run a dragnet. Various sources, including the American Civil Liberties Union, have disclosed widespread use of these invasive and unconstitutional technologies. At last count, the IRS is the thirteenth agency exposed for using Stingray. There is simply no justification for this. If you can think of a legitimate reason, let me know through your comments. These devices are powerful. The ramifications of their capabilities are vast, and their potential for violating privacy is tremendous. Amazingly, all it takes to employ this technology is a low-level court order. Here we are, faced with yet another agency of our government using a baseless tool, for another baseless surveillance program. Where is the outrage? Do you hear anything gnashing of teeth or public outcries begging for this to be corrected? The People have had to speak up and fight for their rights from the outside for too long. Seemingly nobody within the power structures of Government seems to know or care how this violates our rights. At the core of the numerous ventures I have been involved with over the years, privacy, security, and empowering the individual have been the core of everything. These fundamental cornerstones of my ventures are what I have made the hallmark of my campaign for President, and they deeply resonate with everyone I have met along the way. But it is not enough that the voice of the People be heard. No, someone must truly take their pleas to heart, and make the People’s will and rights meaningful again in our system of government. History shows that the People’s will being enacted is inevitable; whether through revolution, reform, or a shift in spirit. Luckily, our Founders gave us a government which allows for peaceful “revolutions” every four years. These abusive Federal Agencies must be held to account, they must be checked, and they must be restrained by any means necessary. We must tear down the status-quo mentality that has allowed these abuses of our rights, and the violation of our will to happen. Agency after agency has torn from our lives the liberties, which God, and our Founders, recognized, were unalienable and fundamental to our existence as human beings. This must end immediately. As President, my first order of business will be instituting Office of Digital Transformation. The purpose of this office is to protect the People, with only the People in mind. The U.S. Government, at the Executive level, must immediately create an Office of Digital Transformation, with the imperative to develop cyber defense systems and procedures within every department of the Executive branch. The development of these systems and procedures must be given the highest priority. Cybersecurity, privacy, and free speech are too important to be treated as “also” items. You cannot, on the one hand be legislating, and on the other have full responsibility for one of the things we value most. You cannot realistically balance national affairs, the economy, the budget, and this entire world of executive affairs and do justice to the digital concerns of the people. I take very seriously the Oath of Office of the Presidency. I believe that the President has a unique ability to protect our liberties. As your President, I will make your rights and liberties my main focus, not holding or growing power. If you agree with this vision, I humbly ask for your support in my campaign for President of the United States of America.